Eger Pictures & Photos, Hungary. Eger Photography, fotos images. Pictures of Eger Hungary. Photos & images of Eger Landmarks. also buy as stock images or photo art prints. 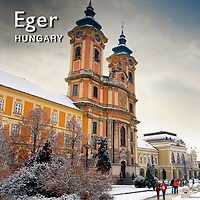 Eger (German: Erlau; Turkish: E?ri ) is the second largest city in Northern Hungary, the county seat of Heves, east of the Mátra Mountains. Eger is best known for its castle, thermal baths, historic buildings (including the northernmost Turkish minaret), and red and white wines.